The latest issue of Sports Technology (subscription required) spotlights recent developments that seek to close the gap between able-bodied athletes and para-athletes, with two published articles highlighting running prostheses. 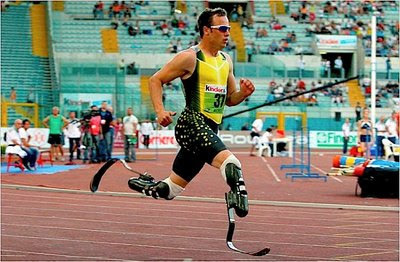 The first article, entitled "Biomechanics of double transtibial amputee sprinting using dedicated sprinting prostheses" compares the sprinting mechanics data of able-bodied sprinters with that of a double transtibial amputee by examining the overall kinetics and the kinetics at the joints – while sprinting at maximum speed. In this article, the authors conclude that the carbon blade used by the amputee sprinter has a significant advantage in both energy storage and return in fast sprinting, in comparison to the healthy human ankle joint. The blade allows the disabled sprinter to deliver the same level of performance as an able-bodied athlete – but at a lower metabolic cost. If true, this discovery will have implications for those runners like Oscar Pistorius who hope to compete against able-bodied athletes. The second article, "Lower Extremity Leg Amputation: an advantage in running?" describes the clinical view of fitting an amputee with a prosthetic leg. The paper provides a general overview on prosthesis technology. It highlights the challenges and disadvantages of a prosthetic fitting – including the difficulties in selection, fitting and the alignment adaptation of the socket; as well as other issues such as the compensatory strategies of the amputee. I think your headline's behind the tech- sounds like the gap's closed. It looks like the day is coming where steroids get replaced with artificial limbs to improve performance. Although, I do like that our technology is helping the disabled population become more functional in sports and recreation. That ties in to your post yesterday with extending peoples healthy and productive lifespan through science. But these breakthroughs will forever change the world of sport.